Including Rubble Trench and Rock Foundation, Wattle and Daub, Earth Bags, Cob, Natural Plasters, and Rocket Mass Heaters! For thousands of years, people have been building their homes out of the dirt beneath their feet. Natural and vernacular building techniques have roots in every culture around the world, but share the distinction of using local materials, being energy efficient, and having a low ecological footprint. Only during the past century have natural building methods been replaced by the construction industry which is characterized by an unsustainable sourcing of non-renewable resources, energy inefficient design, and a huge carbon footprint. 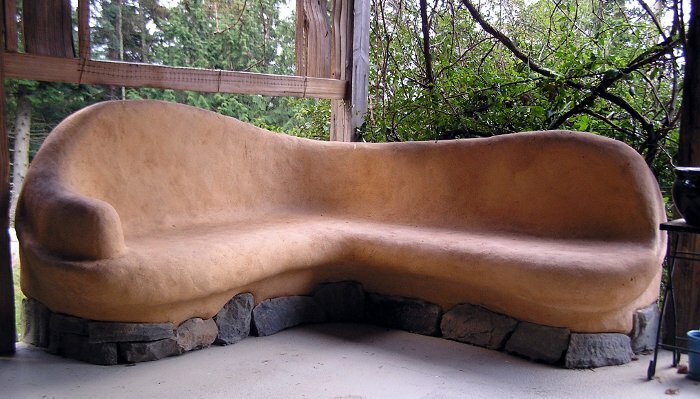 Natural building techniques allows individuals to use their hands and feet to form earth mixed with sand and straw, a sensory and aesthetic experience similar to sculpting with clay. 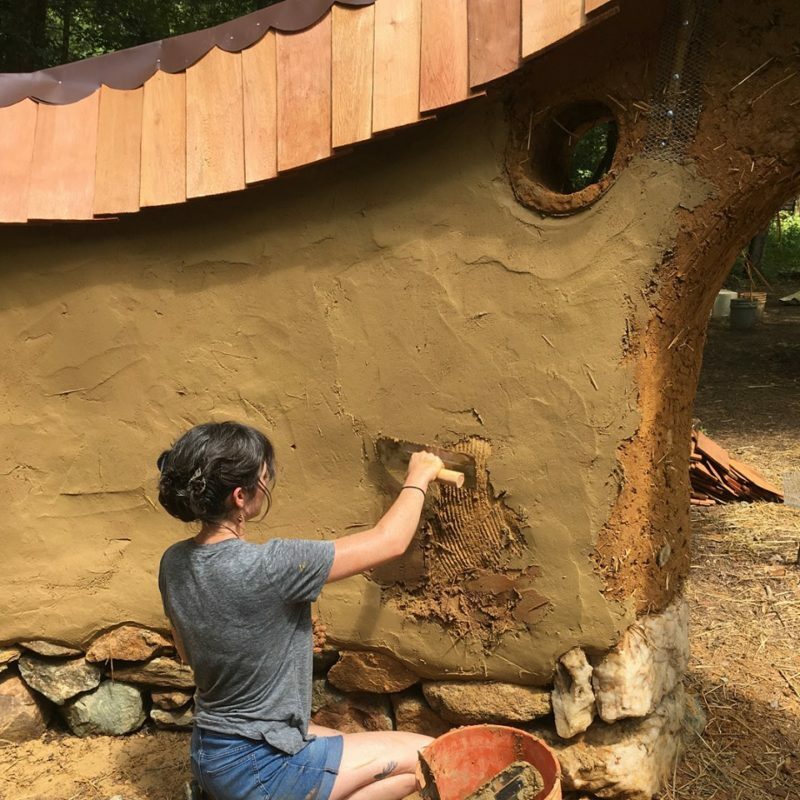 Natural building is easy to learn, inexpensive to build, and lends itself to organic shapes such as curved walls, arches and niches. Earth homes are cool in summer and warm in winter and maximize the capture of natural sources of energy. Natural building methods don´t contribute to deforestation, pollution or mining nor depend on manufactured materials or power tools. In this age of environmental degradation, dwindling natural resources, and chemical toxins hidden in our homes, doesn’t it make sense to return to nature’s most abundant, cheap and healthy building material? 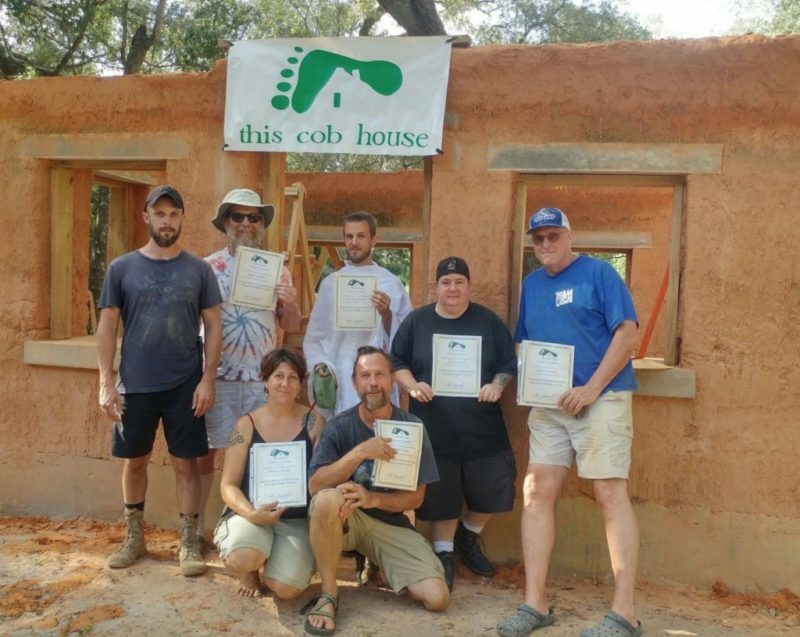 This six day workshop will cover considerations on picking a house site including passive solar design, building a rubble trench and natural rock and lime mortar foundation, wattle and daub wall construction, earth bag construction, cob construction, natural, earthen plasters, and rocket mass heaters. Specifically, we will be finishing the cob and wattle and daub walls on the first floor of a hexagon-shaped classroom for an organization that designs cross cultural learning experiences. We will also be building a rubble trench and rock foundation for another cabin, incorporating earth bag furniture into the hexagon classroom, installing a rocket mass heater/stove in the kitchen area, and finishing up plaster work on another finished cabin on the land. We offer private transportation from the Guatemalan airport to Santiago Atitlan and vice versa. Lodging will be at a comfortable local hostel with Wi-Fi and hot water showers in the heart of Santiago Atitlan where you will be able to enjoy the vibrant night market of a beautiful and unique Mayan town. 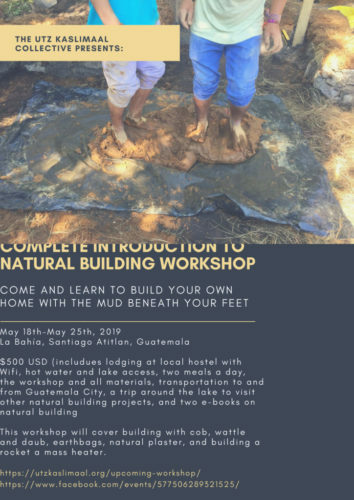 Included in the price of the workshop is a day-long tour of several communities around Lake Atitlan to experience and learn about other types of natural construction projects including cob, adobe, and bamboo building, two meals a day, and snacks. We have found that participants like to have free time in the evenings to explore the town and enjoy dinner on their own. Lake Atitlan is one of the three major tourist attractions of Guatemala, sharing the distinction with the ancient Mayan center of Tikal and the classic Spanish colonial city of Antigua. The Lake lies in the Central Highlands of Guatemala, 80 miles west of Guatemala City and three hours by car along the Pan American Highway. Lake Atitlan has long been considered by discriminating travelers to be among the most physically beautiful lakes in the world. But, the magic is not just the Lake. It is also the surrounding volcanoes and escarpments that frame this 130-square kilometer surface of sparkling water. It is the sun and breeze, playing on the Lake’s surface, nudging it into revealing its capriciously changeable character. The enchantment of the Lake is also found in the proud but friendly Mayan people living along its shores that hold to the essence of their cultural identities while adapting to modern conveniences that fit their pragmatically adjusting view of the Universe. The Popul Vuh describes the mythic journey and arrival of seven tribes of warriors to a place called Tulan. In this account, the Tz’utujil are the first of the seven tribes to arrive. Existing evidence indicates that Tz’utujil-speakers once occupied the territory surrounding Lake Atitlán as well as the southern expanse of territory to the coastal lowlands. Santiago Atitlan is the largest of the 12 lakeside communities and is the principal population center of the Tz’utujil people. Its population is over 32,000, with about 95% indigenous. The town is located on the embankment of broken lava at the foot of Volcano Toliman, across the bay from the pre-Conquest Tz’utujil capital, Chuitinamit. The survival of the Tz’utujil Maya and the existence of present day Santiago Atitlan, one of the largest intact communities in the Americas, give powerful testimony to the spirit of Tz’utujil resistance. In addition to learning about natural building methods, during your visit to Lake Atitlan you will be afforded the opportunity to participate in numerous activities that engage the rich local Tz’utujil culture and that invite you to experience the recreational possibilities of the surrounding environment. These activities range from hearing from and dining with local ancestral leaders and spiritual authorities, to spending a day touring the Lake by boat and visiting different towns to see magnificent examples of the very natural building methods you have been learning about and putting into practice. Of course, if you would rather just relax and enjoy your pleasant lodging accommodations, or meander around Santiago Atitlan and enjoy a cup of coffee or beer, you are more than welcome to do so. Nevertheless, we from the Utz’ K’aslimaal Collective, want to make sure that you have every opportunity to enjoy the immense natural and cultural beauty of Lake Atitlan. As man increases his presence at Lake Atitlan and as modern culture increasingly imposes its influence here, the balance of the Lake ecosystem becomes increasingly prone to destabilization. The challenge to find ways to adjust the demands of our communities so that they fit into the greater balance of the Lake ecosystem is exacerbated by unique demographic factors as well as the attractiveness of the Lake as a tourist destination. The profit sector of modern mass culture has loaded the Lake environment with products to promote material progress without considering the serious side effects. The indigenous communities that inhabit the Lake, and the outsiders who increasingly call it home, are just beginning to appreciate the consequences. With the alarm having sounded, today there are many organizational actors which play active roles in preserving the Lake as a healthy, living entity. These include international, national and local environmentally-focused groups directly engaged in the dynamics of protecting the Lake ecosystem. Still, there is a good deal of “catching up” to do, and the Utz’ K’aslimaal Collective is one of these actors joining the effort to design ecological forms of livelihood that respect the natural limitations and boundaries of the land itself. On a pragmatic level, the Utz´ K´aslimaal Collective seeks to demonstrate a tangible example of sustainable living, ecological land design, and natural construction. All of the structures built on the land are made from locally available, natural materials. In the long term, we hope to build a center to launch a diverse array of educational programs that allow Western people to learn from indigenous people, engage in exchanges of mutual solidarity, and offer a new standard of tourism that involves and values the local community, culture, and environment. As an organization that seeks to belong to and participate in the life of the community that has accepted us, this workshop will also open spaces for local Tz´utujil youth to learn about natural construction techniques. The migration of young people to North American is a huge issue affecting the local community. Many young people choose to migrate in order to raise money to build a modern home of their own which can be prohibitively expensive. Through helping young people to discover the vernacular, beautiful and natural methods of construction, we also hope to add a small contribution towards helping young Tz´utujil people stay in their communities. Guatemala has gained international notoriety as a country reeling with violence from youth gangs and drug trafficking. However, the vast majority of this violence is confined to the urban areas of the country. The town of Santiago Atitlan, where the workshop will be held, is a quiet, peaceful town where violence of any type is a rarity. Workshop participants will be picked up directly from the airport and driven (by van) to the small town of Santiago which is about 3 hours west of Guatemala City. Rubble Trench and Stone Stem wall: Instead of relying on concrete footers, we will explore how you can build a strong, reliable foundation for your home that offers both structural and drainage functions with nothing but natural materials. Earthbag: Filling polypropylene sacks with stabilized earth allows you to build massive, thick, and sturdy walls for your home. We´ll be building a fence out of earthbags during this workshop. Rocket Mass Heater: This is one of the most energy efficient ways to heat a home, and uses a cob bench as a thermal mass that will hold in and radiate the heat during long, cold nights. Each day of the workshop will offer a mix of classroom style conceptual/theoretical instruction in the mornings and several hours of practice with the different natural building methodologies that we´ll be using. We believe that natural building is best learned through “doing it.” Our days usually start with an hour or so of theory over breakfast before heading out to the construction site and getting our hands and feet dirty. We will also have the opportunity to visit several naturally built structures around the Lake and process what we´ve been learning at the end of each day. Each participant will receive two e-books with information on the natural building methods that we´ll be covering and electronic copies of several leading books in the natural building niche. Transport service between the Guatemala City airport and Santiago Atitlan. Community lodging in Santiago Atitlan’s famous lakeside hotel, Posada de Santiago<http://www.posadadesantiago.com/lodging.php>, which includes the use of its beautiful campus, a jacuzzi, heated pool, bicycles, and canoes/kayaks. Six (full) days of workshop. A day tour of the Lake, in which you will travel by boat to different towns to see magnificent examples of the very natural building techniques you have been learning about and putting into practice. Two meals a day (breakfast and lunch) and snacks throughout the day. Private lodging in a clean and comfortable local hostel. Daily you will be provided with breakfast, lunch, dinner, and refreshments. What Is the Utz’ K’aslimaal Collective? Almost all indigenous cultures around the world have a unique understanding of what it means to live the Good Life. For the Mayan Tz´utujil people of Guatemala, the Good Life, or Utz´ K´aslimaal, is characterized by a life of balance, of proper relationships with the community and the land which holds them, and the fullness of a simple life lived well. The Utz´ K´aslimaal Collective believes that the indigenous concept of the Good Life and the inimitable worldview of the Mayan peoples from Guatemala especially, offers needed guidance, wisdom, and a practical path forward in the light of the multiple crises we collectively face on a global scale. Through our connections with the indigenous communities and territories around Guatemala, and through the ecological development of a small piece of land in Santiago Atitlan, we hope to offer a glimpse into how the Good Life might open pathways for the construction of sustainable, just, and balanced communities around the world. We understand our privilege, and don´t try to hide the fact that, at the most basic level, we are in some ways continuing a history of dispossession and violence towards the Mayan people of Guatemala. The piece of land where Utz´ K´aslimaal Collective is located was originally forcefully appropriated from the Tz´utujil people by a coffee baron at the turn of the 20th century. The land was then sold off to some of the wealthiest families in the country who privatized the land in hopes of turning the land into an exclusive country club for the oligarchy. Today, thousands of foreigners come to the beautiful Lake Atitlan area and purchase the best pieces of land in order to create projects or businesses from the ample financial resources they have. In the vast majority of cases, these privileged foreigners never make an effort to belong to the reality of the indigenous communities around the Lake, but rather impose their values, ideas, worldview, and financial influence onto communities that struggle to maintain some sense of autonomy and sovereignty. We have seen time and time again that that the tendency for these types of local/non-local relationships is to be exploitive, oppositional and ugly; offering meager employment opportunities at the cost of a more fundamental and structural dispossession of indigenous communities and their ancestral territories. One of the guiding values of the Utz´ K´aslimaal Collective, then, is to purposefully and resolutely attempt to embody a new pattern and archetype of local/non-local relationships; one that first disgracefully acknowledges the historical privilege from which we´ve come in order to conscientiously construct relationships based on a profound respect and esteem for the community that has so graciously accepted us to form a part of their reality. As we develop an educational program around the themes of natural building, ecological design, indigenous epistemologies, and place-based development, we want to exemplify a different model of local/non-local relationship that doesn’t just passively benefit the community via menial part-time employment and periodic bursts of income, but actively seeks to create spaces for local decision-making, voice, profit-sharing, and power. This new model of local/non-local relationships is possible because of the way in which we have been formed over the years by indigenous communities and the real relationships that we have built. We don´t look at the indigenous communities of Guatemala and see Instead need, privation, and poverty. Rather, we admire and respect their wisdom and way of life, seek to learn from them, and build meaningful relationships of trust and justice.